base mill and foundry products. mation appears on page 5. 3Represents uninsulated, bare tinnned, and/or alloy coated wire. national money order or by a draft on a U.S. bank. Price, $1.25 per copy, $6.25 per year. primary companies are available in Current Industrial Report M33K, Inventories of Brass and Copper Wire Mill Shapes. company under toll arrangements for the account of controlled materials consumers. the cupping and discing operation. Also includes castings produced and consumed at the same location in the production of finished products. 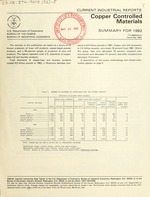 'Source: Bureau of the Census, Current Industrial Report M33E, Nonferrous Castings. 2Comparison of domestic manufacturers' shipment, export numbers, and import numbers for copper-base mill and foundry products is shown in table 4.
products) are based on data for 1980 which are published in Origin of Exports of Manufactured Products, M80(AS)-6, appendix B. 6Represents the c.i.f. (cost, insurance, and freight) value at the first port of entry in the United States plus U.S. import duties. The import and export numbers for this line do not include wire. be found in the January 1982 publication for this series. acknowledged and which have not been shipped.